Egg freezing no longer experimental: American Society for Reproductive Medicine reclassifies the procedure. A technician opens a vessel containing women’s frozen egg cells. 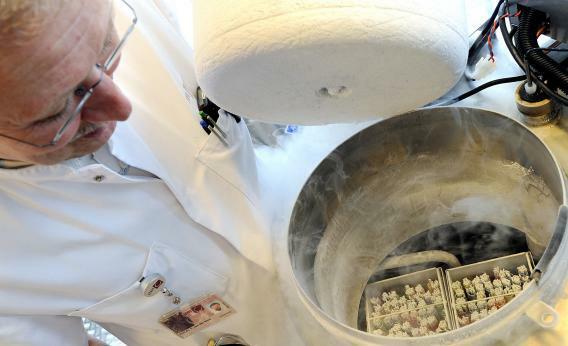 The American Society for Reproductive Medicine has reclassified the process of freezing egg cells for future use, no longer calling the procedure “experimental,” and therefore opening the door for a rapid increase in the use of this technology. NPR’s coverage of this news focused entirely on the exceedingly rare woman who is paying thousands of dollars to freeze her eggs as insurance against age-related fertility decline, suggesting that it’s now a lot more feasible for women to freeze their eggs in their 20s or early 30s with the hope that they’ll meet Mr. Right later in life and still be able to have babies. Basically: Feminism told you that you can have it all? Well now you can! Don’t believe the hype. This shift doesn’t mean that egg-freezing is a realistic panacea for women who worry that career concerns and the dating market will make child-bearing economically or personally infeasible until their 40s. A more in-depth piece from Marie McCullough at the Philadelphia Inquirer provides more context. Yes, dramatic advancements in the freezing technology have improved the rate of conception with thawed eggs, but it’s also clear that the technology was mainly developed for very young cancer patients whose ovaries are going to be wiped out by chemotherapy. The new guideline still advises a go-slow approach. It recommends egg freezing for patients facing sterility because of cancer treatment and for couples who object to freezing embryos, but not for healthy women worried about using or losing their eggs. “We’re not saying don’t do it” for healthy women. “We’re saying, proceed with caution,” said Samantha Pfeifer, a University of Pennsylvania fertility specialist who chaired the guideline committee. “For women in their late 30s and early 40s, success rates are not as good” as for younger women. From a scientific perspective, the ASRM made the right call. But the reasons not to put your hopes on freezing your eggs as insurance against age haven’t changed. The chances of success don’t justify the expense for most people: The process costs thousands of dollars, but only 12 percent of thawed eggs are fertilized. (And even then, the studies include women who froze their eggs in their adolescence and early 20s, not just panicked 35-year-olds.) Also, the process of freezing eggs is somewhat dangerous, including a possible higher risk of developing ovarian cancer. Women who don’t have STD-related health issues or other lady problems that hurt fertility may be overrating how much their fertility is going to decline as they age. Bluntly put, I remain suspicious of doctors who are willing to take thousands of dollars from women to put them through this process on the slim hope that it’s going to solve their work-life balance dilemmas.